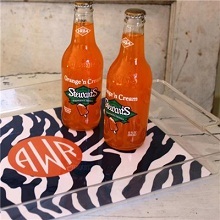 Celebrate with friends or organize your office in style with this personalized acrylic tray from Clairebella. From serving hors d’ouvres to containing desk clutter, this tray is truly multi-functional and makes a fabulous housewarming gift. A laminated insert allows you to personalize the look by choosing from several colors, patterns and fonts to add an initial, monogram or name. Wipes clean for easy maintenance. Made in the USA. *All personalization is custom ordered exactly as entered below, please use upper and lower case as you would like to see on the finished piece and note that text is case sensitive according to chosen font. Please review the options available by clicking the “Style Options” button below. Max 3 characters.